What will the city eat, when the city has ‘eaten’ the country’s elite growing soils? 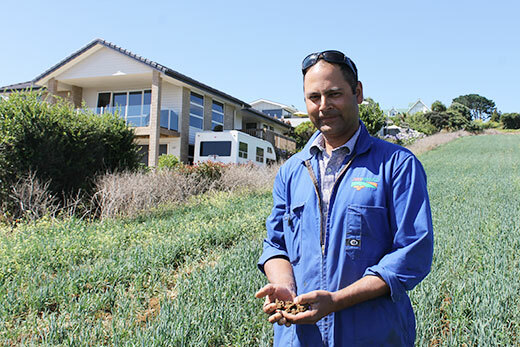 Pukekohe Vegetable Growers Association president Bharat Jivan is among local growers operating on land adjacent to houses. That’s a question members of the Pukekohe Vegetable Growers Association are asking as urban growth threatens to engulf the rich growing soils in their region known as “the food bowl of New Zealand”. Horticulture New Zealand and growers represented by the Pukekohe Vegetable Growers Association are so concerned they’ve made extensive joint submissions to the Auckland Unitary Plan’s independent hearings on behalf of growers. PVGA president Bharat Jivan joined the list of experts and growers at hearings to appeal for protection for the unique climate and soils in the Franklin district. The Auckland Plan has identified Pukekohe as a priority satellite town for 50,000 people and 9000 new jobs in the next 30 years. The Proposed Auckland Unitary Plan includes future urban zone land around Pukekohe, for residential, business and industrial use. Bharat says the urban area has been moving into prime production land for years and many growers, including Jivan Produce, which he co-owns with his brother Pravin, have houses as close neighbours. “In the last 40 years, about 10,000 hectares of elite and prime land has been lost to urban development.” This includes areas at Otahuhu, Papatoetoe, Mangere and Pukekohe. 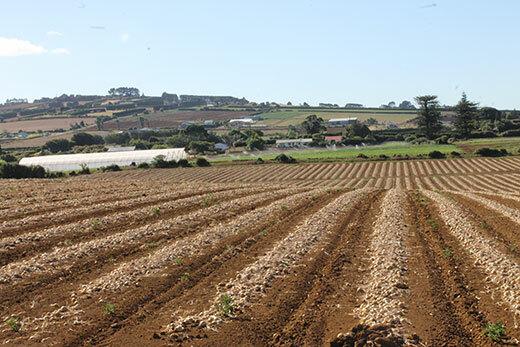 Pukekohe’s elite soils and location are irreplaceable, HortNZ and vegetable growers believe. Pukekohe soils and their location are irreplaceable, and should they be lost New Zealand’s year-round supply of vegetables such as potatoes, onions, carrots and lettuce would be seriously impacted. “At the hearings I was asked why we couldn’t grow vegetables somewhere else, such as Northland. And while we could, we couldn’t do it as well because nowhere else in the country can replace the unique combinations of soils, climate and location which we have at Pukekohe. Bharat says there are areas of Pukekohe not well suited to horticulture and vegetable growing, and these should be earmarked for subdivision, while the elite soils are protected. Having houses right on the boundary of a market garden is not ideal for either party. But not all urban neighbours enjoy being in close proximity to food production and this can be extremely difficult to manage. 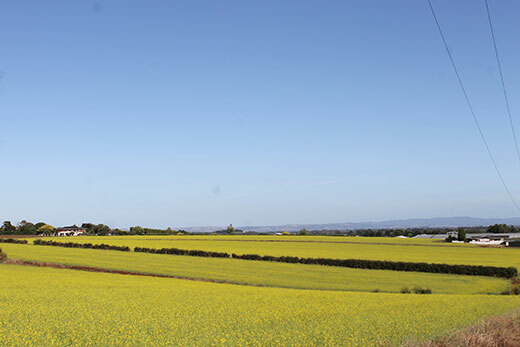 The yellow flowers of mustard, grown as a cover crop between production crops, make a striking addition to the Pukekohe landscape. Bharat says any further reduction in the areas of elite and prime land available for production will reduce the total economic contribution of the area, and reduce security of food supply. “In my view it is sensible and in accordance with sustainable management, to exercise some control on factors which will restrain rural production activities, or displace them entirely,” Bharat told the hearings. He’s also concerned about food safety and food security. “As an isolated country, we do not want to be reliant on imported produce where food integrity cannot be guaranteed. “We need to produce good quality, affordable fresh food for New Zealanders. This season’s potato shortage is a good example of the importance of food security. Bharat is a third generation grower and co-owner of Jivan Produce Ltd, which farms on 250ha of land growing mainly onion and potatoes, but also lettuce. It’s hard work, even with the use of modern machinery, and profit margins are tight – including this season with a global glut of onions creating low demand for New Zealand produce. 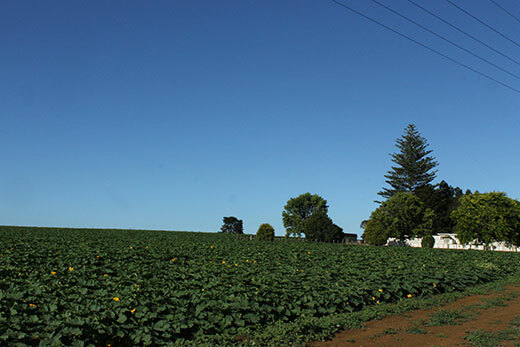 Pumpkins are among the crops grown at Pukekohe. Succession planning for some growers is a concern because their children don’t appear interested in taking on the family business, but Bharat says most growers would prefer to see their land sold to other gardeners, than for urban development. However, if not protected under council or government regulation, the land’s potential to be developed for housing increases its value and so its rates, in effect rating growers out of business.